Contact Megan Popp, Director of Community Connections with questions or to RSVP. Immanuel's theme Bible verse is the well-known Proverbs 22:6, "Train up a child in the way he should go, and when he is old he will not turn from it." It is interesting to note that the original Hebrew does not include an indication of "should," so a truer translation is "Train up a child in his (or her) way, and when he is old he will not depart from it." This is also a truer description of the education offered by Immanuel Lutheran School. 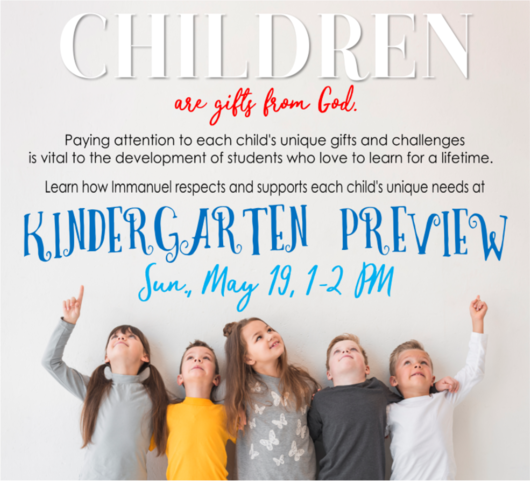 Your family is invited to Kindergarten Preview at Immanuel on Sun., May 19, 1-2 PM, see for yourself how Immanuel implements this belief. Children will have an opportunity to listen to a story read by Kindergarten teacher Miss Dickenson and enjoy craft time based on the story. Meanwhile their parents will tour the school and participate in a Q&A session with a parent panel. Parents will then rejoin their children for light refreshments. Those who have additional questions are invited to talk with the principal and admissions director at this time. We believe that each child is a special gift from God, to be encouraged to develop socially, emotionally, physically, cognitively, and spiritually. Our goal is to accept and affirm each child’s unique competence and provide appropriate activities that will challenge him/her to continued growth to reach his/her potential. As these truths are experienced, he/she grows in self-esteem, accepting God-given gifts and limitations. This becomes the foundation for learning, enabling the child to respond boldly and confidently as God’s child and a life-long learner. We live this truth at Immanuel by providing the space, time, and opportunities to help Kindergartners manage this important milestone: the first day of "real" school. While the vast majority of these young students have attended preschool and participated in other child-centered programs, Kindergarten is different. They tend to make friendships more slowly, playing with more than one child at a time is still tricky, social skills are tested, and self-control can be tough when confronted by so many new rules and routines. Paying attention to each child's unique gifts and challenges is vital to the development of students who love to learn for a lifetime. When you visit Immanuel you will see a spacious, contemporary campus with ample room for learning, indoor and outdoor play, classroom activities, and worship. Our caring, experienced staff greet their students at the door and guide them to the activities best suited to acclimate them to the new school day. There are a wide variety of family situations when it comes to where and how young children spend their days. Full-time child care by an in-home nanny, a family member, a daycare center, and private home daycare are a few of the options. There seem to be as many situations are there are families. At Immanuel we feel we have been able to meet each family's and each child's needs with our Kindergarten and KindergartenALL early childhood education programs. Kindergarten meets Monday-Friday, 8:45-11:15 AM, while KindergartenALL meets 11:30-3:15 PM. During morning-only Kindergarten pick-up, students work on table activities, supervised by the classroom aide, while the teacher ensures each morning student has a peaceful dismissal. After lunch with the "big kids" (Grades 1 and 2) in the lunchroom, KindergartenALL students go back to the classroom for enrichment activities. Each student receives the care and attention--and classroom time--best suited to his/her unique needs. Morning students receive the prescribed instruction to ensure readiness for First Grade, but are not required to sit and engage when the day has gone beyond their ability to do so. KindergartenALL students enjoy supplemental activities and instruction that meet their educational needs. As the school year progresses, parents of morning-only Kindergarten students may (or may not) decide to add the afternoon KindergartenALL section to their child's educational plan. This can be done at any of the three quarter breaks in October, January, or March. Immanuel Lutheran School is currently enrolling for the 2019 2020 school year, and welcomes students of all races, creeds, national, and ethnic origins. To learn more about Immanuel Lutheran School in general, or specifically our Kindergarten/KindergartenALL program, please contact Megan Popp, Community Connections Director, at 630 406 0157 or mpopp@immanuelbatavia.org.